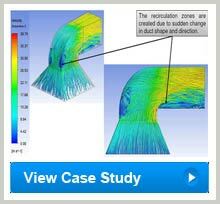 Hi-tech offers Computational Fluid Dynamics (CFD) simulation services for pipes, ducts and manifolds applied in the process Industry. We have the required domain knowledge and experience in analyzing fluid transport scenarios involving various mixing characteristics, temperature and pressure variations in complex channel systems, split pipes, curved pipes such air conditioning vents in buildings, power plant piping and cooling systems. Heat Transfer Analysis to provide designers an understanding on the thermal aspects of the piping systems and therefore enable a better evaluation of the design parameters. This analysis assists in reducing thermal losses, increase flow performance and enhance the heat transfer capabilities by choosing appropriate materials to withstand the operating scenarios. Vortex Analysis for manifolds and ducts to understand the turbulent flow characteristics in the pipelines and manifolds. This enables the designer to effectively design the pumping system without the loss of energy due to turbulence, thus optimizing the power distribution while minimizing the losses. Pressure Drop Analysis to enable the engineers to understand pressure fluctuations occurring in long range pipelines transporting oil and gas. This analysis helps in designing the upstream and downstream equipment to withstand peak loads arising due to large gas or liquid pockets. It also assists in designing alternate methodologies to dissipate the pressure uniformly in the manifold and maintain uniform flow rates across the pipelines. Species Distribution to give an approximate understanding of suspended particulate matter carryover in areas such as ash handling systems, chimneys of power plants etc. This also helps in analyzing various species such as solid, liquid and gas in various ratios to understand its significance and effects for better designing of the system in case of explosive characteristics of the flow mixture.